The ongoing saga of my iPhone restoration project hit a snag, but I am not giving up on it. Read my latest instalment. I took pity on an original iPhone a few months ago and have been fixing it up ever since. I repaired the broken power button and then fixed the subsequent audio issues. The LCD and glass still could do with replacing, but despite the state of them they still work. There were charging problems with the original battery, so I had to replace that, which is no easy task, requiring soldering skills. After replacing the battery about a month ago I had a lucky escape. While it was fine for a few weeks, I went to charge it recently, and it wouldn’t power up. I noticed the silver back wasn’t on properly, and I couldn’t get it to sit right. 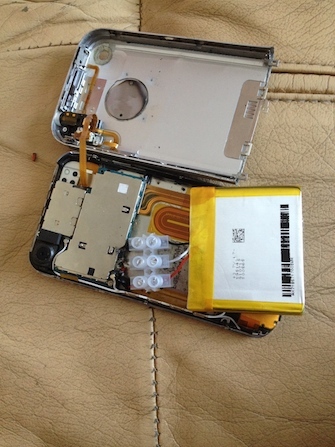 I took the back off and noticed a very bloated battery and a strong smell of antiseptic. I am pretty sure it was down to my poor soldering skills – but I am glad I noticed it before anything happened. In the interest of keeping this poor device alive, I decided to buy another battery and see if the phone was still working. With the wires still attached to the phone, I decided to use some terminal blocks to temporarily attach the battery to see if it works. Success! The phone powered up and was working fine. It might not be together and in its current condition won’t go back together – but it lives. 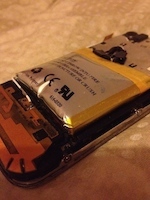 As the phone is working and as I don’t want to damage it further by my terrible soldering skills, I will most likely ask someone else to help connect the battery properly. I have disconnected it for now. I will get this iPhone restored eventually. Look for future instalments to this project. 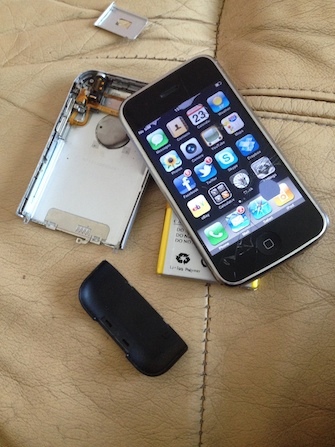 Check out my first two instalments – Reviving an Original iPhone, Part 1 and Reviving an Original iPhone, Part 2. Here is the final part of the saga. Reviving an Original iPhone, Part 4.